As the First AIMNAS Item request thread reached 10 pages, I decided in old Bears Pit tradition to start a new thread. -> You can sugegst next to anything you would like to get added. -> No gazillion AR-15 or Ak-47 variants please. We already have quite a few of these in game, adding more requires more than just being tacticool. -> If it's useful or new, chances are higher to get added. -> 6.5mm Grendel is on my to-do list, I will sooner or later add it. No reason to constantly ask for it over and over again. done! -> You can request food items, as I began adding them to AIMNAS. -> Stuff that made it in can usually be viewed in the AIMNAS Art Gallery. 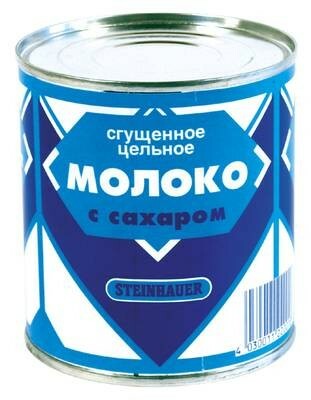 Can of Condensed Milk. A sweet part of soviet field ration. Sorry to have annoyed you, Smeagol. I just think Bill Alexander and his Finnish associate whose name I can never remember or pronounce are geniuses. Nah... no reason to apologize... I added the first 6.5mm Grendel gun just today... so, yeah... 6.5mm Grendel is basically in. I'm surprised they were using methamphetamine instead of amphetamine, but I suppose back then they may have not known about the toxicity difference. Or they were desperate. Low-dose amphetamine is still issued in the behind-enemy-lines kits of some units, I think. What about an aperture sight? Found no good picture though. There's already a crossbow in the game, and a dart rifle. I'm not sure if there's any reality behind it, but Crysis and maybe Splinter Cell had underbarrel-mounted paralytic dart launchers. It's terrifying to think about, but we may be running out of guns! cz vz 83 .32 acp high capacity magazine pistol ..
yes exactly, it might work as a low end scope for Western style and bolt action rifles, I just don't know if it's worth the effort to put it into the game, but that's up to you. As far as I know aperture sights were the forerunners of scopes, nowadays there are used on sporting rifles, especially air guns. More single-shot hunting pistols would indeed be nice. I believe Smeagol hates single-shot hi-caliber pistols, that's why he removed contender encore (or whatever its name) from AIMNAS, the only gun which exist in vanilla but not in AIMNAS. I wouldn't exactly call it "hate"... those guns are just really easily outclassed by basically very other gun, making them next to useless. I don't see a real reason to have have them in game. The Contender falls short in many ways. As I see it, the pull of a single-shot pistol would be high accuracy and damage with decent range in a fairly small package. As far as I know, there are some .308 and .30-06 pistols out there. Tasty. But what's the point in all these pistols being added? The point of the vast majority of guns in AIMNAS is to have variety, not only in looks but in function, don't want to have Smeag wasting his time on trivial designs when we have the same weapon functionally speaking. I'm more interested in the concept itself than in a particular model. What about an revolving rifle, there a both historic and modern models. Revolver carbines are on my to-do list (like the one used by Lee van Cleefs character Col. Mortimer in "A few dollars more"). So yeah... at some point a few of these will very likely make it in. smeagol:can please look at this item ? @Wolf: Hmm... might add it. Is it more comparable to Glaser or more like BAT/Golden Sabre? The BML looks interesting - is the game capable of handling box magazine grenade launchers? The PET bottle silencer would have to be a onetime use item. Don't think that is possible at the moment. I like the idea , though (yes, I've also seen Shooter...). As for the UGL. Making a stock for the UGL to use as a standalone is next to pointless at the moment, as you can fire all UGLs without a gun/stock they are attached to. Unless that gets a change somehow (like -> if item is UGL it can only be used if it is attached to something. Problem solved), no need to add stocks that take UGLs. Yes. 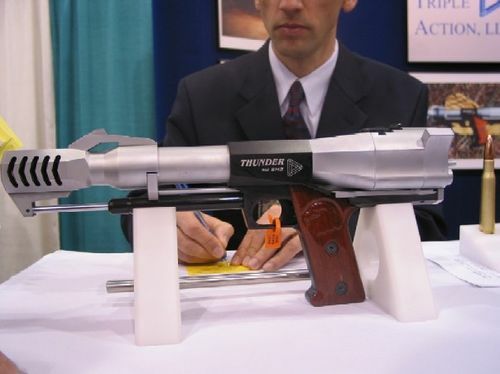 This is basically the same as the Milkor/Xm-25 and the like. Nothing spectacularly new here. Only thing different would be reloading time. 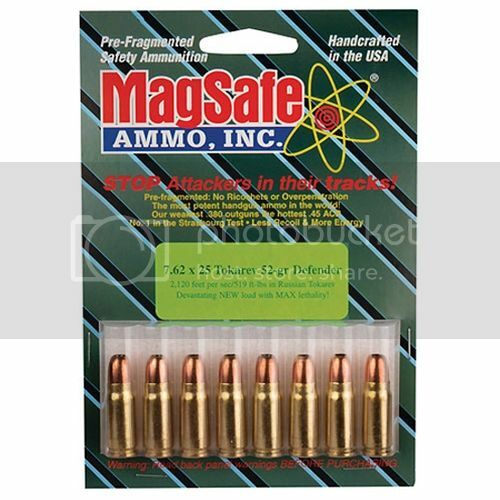 When not fed from a magazine you would need very low Ap costs for each single round to get loaded. 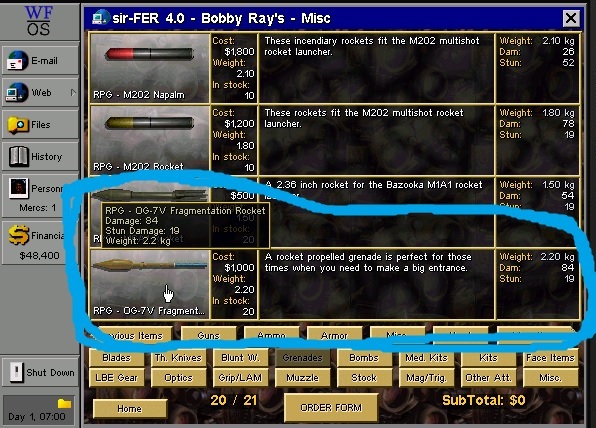 So the basic idea of having a GL that has more than one round capacity is already in (some GL even used to have magazines before, but that didn't allow to mix different kind of greades, like the 20mm and 25mm grenade mags of the aforementioned XM-25 and the OICW... even the metalstorm 40mm stacks use the same principle). For the plastic bottle suppressor, would it be possible to program it as non-repairable, with an extremely low durability? If I understand properly, that might be a way to make a single-use item. The Beardmore-Farquhar MG is an interesting looking weapon, if nothing else. Apparently it was never adopted by any armed force, which could mean it wasn't very reliable. So how do you think, can proper OG-7V "Oskolok" ("Splinter") be added and the existing grenade to be edited for a right name? It's a fragmentation grenade with really low explosive charge and body with incised segments which create a cloud of fractions in all directions upon explosion. I was thinking about that shrapnel effect used in some grenades. It might be a cheap ($700-800) option against infantry, no way this thing to make huge holes in walls or make damage to tanks. Deidranna's commandos might like it since rebels don't have so many materiel, but this tool comes in handy when you need to take back that SAM. Some technical info and more photos for OG-7V "Oskolok" under the spoiler. 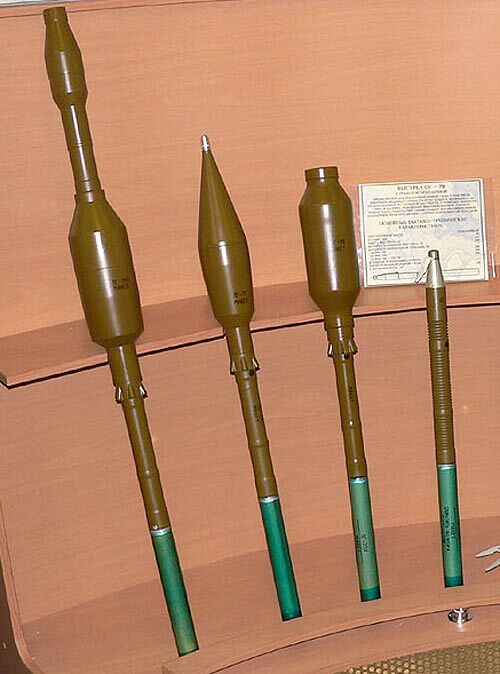 Agree on OG-7V, the picture is wrong, this type of rpg has unofficial name of "pencil" for it's shape. Some sources say that this grenade does not have jet engine, and that results in greater accuracy. Added the OG-7 and fixed the other rocket.